The Archdiocese of Philadelphia today announced that the sacred remains of Saint Katharine Drexel will be transferred from the Sisters of the Blessed Sacrament Motherhouse and Shrine in Bensalem, Pennsylvania, to the Cathedral Basilica of Saints Peter and Paul in Philadelphia this summer. 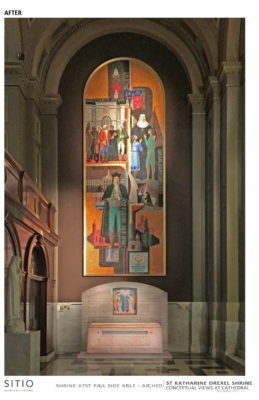 The new location for Saint Katharine Drexel’s tomb will open to the public in September 2018 following the completion of the newly constructed Cathedral tomb. In addition to the relocation, the Archdiocese of Philadelphia also announced several new programs to promote the life, work, and witness of Saint Katharine Drexel. These programs include school-based lesson plans, an online and television documentary, a newly-launched website hosted by the Cathedral Basilica (www.cathedralphila.org), new social media sites, and a Mass of Thanksgiving celebrated by Archbishop Charles Chaput, O.F.M. Cap on Sunday, November 18, 2018. The construction and communications program are generously underwritten by a grant from the Connelly Foundation. Saint Katharine Drexel was canonized on October 1, 2000. She is the second American-born person ever to be canonized. Born into tremendous wealth as part of the Drexel family, she gave up her life of privilege to found the Sisters of the Blessed Sacrament in 1891. She dedicated her life to serve the needs of African Americans and Native Americans, and inspired so many women, who joined the Sisters of the Blessed Sacrament, to follow her example. Today, the Sisters continue to serve in elementary and secondary schools, as well as at Xavier University of Louisiana in New Orleans, the first Black Catholic university in the U.S. They are also involved in a variety of other services including pastoral and spiritual ministries, social services, counseling, religious education, and health care, primarily but not exclusively among Black and Native American peoples. In May 2016 the Sisters of the Blessed Sacrament announced their decision to sell the Motherhouse property where the current shrine is housed, along with other property in Virginia. At that time the Sisters asked the Archdiocese to consider creating a sacred space for Saint Katharine’s remains. Earlier this year, the Archdiocese agreed to create a new space for her tomb at the Cathedral Basilica. This new tomb will be immediately adjacent to the Drexel altar donated by the Drexel family decades ago. Open since 1864 and located at the east side of Logan Square on 18th Street and the Benjamin Franklin parkway, the cathedral is the mother church of the Archdiocese of Philadelphia. Sisters of the Blessed Sacrament, founded in 1891 by Saint Katharine Drexel, is a congregation dedicated to the interracial apostolate in the United States, Haiti, and Jamaica. Today, Sisters of the Blessed Sacrament serve in elementary and secondary schools, as well as at Xavier University of Louisiana in New Orleans. They are also involved in a variety of other services including pastoral and spiritual ministries, social services, counseling, religious education, and health care, primarily but not exclusively among Black and Native American peoples. The Motherhouse of the Sisters of the Blessed Sacrament is in Bensalem, Pa. The Connelly Foundation was founded in 1955 by John and Josephine Connelly. John Connelly achieved remarkable business success as president of Connelly Containers and later Crown Cork and Seal, both manufacturing companies based in Philadelphia. He and his wife, Josephine, strongly motivated by their Catholic faith and their love for the Philadelphia region, dedicated their good fortune to helping others. Over the past 63 years the Connelly Foundation has donated more than $400 million to nonprofit organizations in the Philadelphia area focusing on education, human services, and the arts. The Connelly Foundation has always placed a particular emphasis on Catholic education, with nearly 10,000 Philadelphia-area students having attended Catholic high schools through the foundation’s Neumann Scholars and Josephine C. Connelly scholarships.